The Prandtl-M completes a successful research flight. Image courtesy NASA and Lauren Hughes. Flight tests have resumed on subscale aircraft that could one day observe the Martian atmosphere and a variant that will improve collection of Earth's weather data. In addition to confirming the aircraft's shape, the first flight data was collected on the Prandtl-M flight. Hussein Nasr, who is an intern at Armstrong pursuing a master's degree in aerospace engineering from California State Polytechnic University in Pomona, was especially excited by the data collection he has been waiting for to refine aerodynamic models. That's not to say he hasn't learned a lot during his wait. "I learned about simulation testing and how to filter out the noise to get good data," Nasr said. "There is a difference between the theoretical and the real world and a lot of data hides in the background." Finding exactly the right students for each of the many tasks on a project like the Prandtl-M takes planning, coordination and intuition said Dave Berger, a key driver and manager of the education side of the effort. "It is more important to find that student who has a passion for an area, a desire to be here and enthusiasm for that task - as opposed to finding the best credentialed student," Berger said. "We try to find a match with the students' individual skills." Finding the right personnel is, "especially important for the Prandtl-M project because every student is a lead, so every student has ownership for their portion and I think that really helps us make progress in all the areas and keep moving forward," Berger explained. The transition from students' term-to-term college schedule is another challenge. "We get most students from 10 to 16 weeks at a time," Berger explained. "That has helped shape our project culture of documenting procedures so that anyone can come in and figure out and recreate what has been done through the documentation." 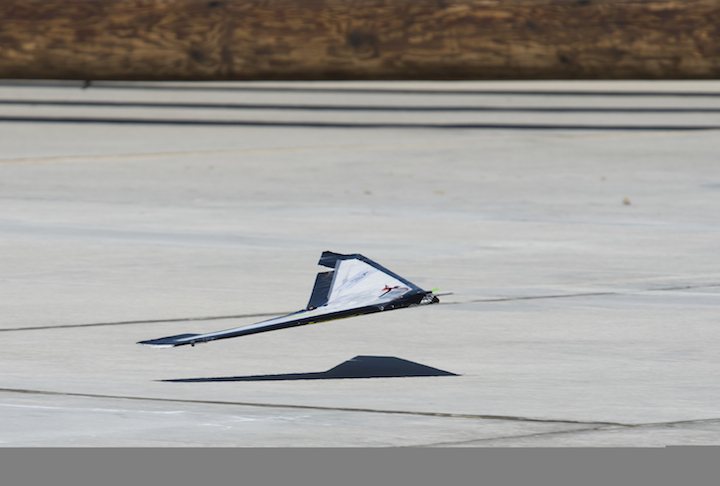 Flights with the subscale foam aircraft confirmed the aerodynamics are solid, said Robert "Red" Jensen, who is Armstrong's Small Unmanned Aircraft Systems chief pilot and master technician for the Dale Reed Subscale Flight Research Model Lab. "The flights looked at aerodynamic stability," he said. "The design is starting to gel and the target is a stable airframe and fine tuning the autopilot. Then we will target a flight from a weather balloon at increasing altitudes to test the systems later this year." Once the preliminary flights are complete, sensors can be added to collect weather data from weather balloons at Armstrong. The ultimate proof of concept is a flight from a balloon at 100,000 feet altitude or more to demonstrate radiosonde replacement capabilities and returning to the launch site for reuse, said Scott Wiley, Armstrong WHATTRR Glider project manager. Al Bowers, NASA Armstrong chief scientist and Prandtl-M project manager, said systems that will fly on the aircraft during the balloon air launch, such as the guidance controller, have already been tested in an altitude chamber at Armstrong up to 126,000 feet altitude. NASA Innovation Kick Start grant funds the WHAATRR Glider following the project's winning submission during the 2016 NASA Agency Innovation Mission Day in November.